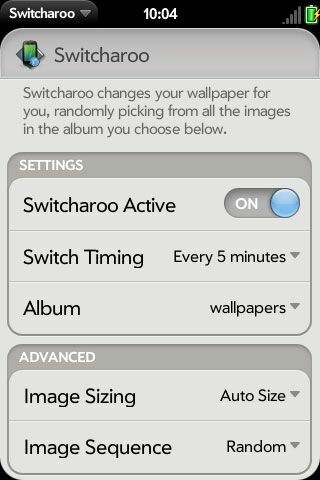 Switcharoo is a nifty utility that will randomly switch your wallpapers for you, based on a schedule, (once an hour, once a day, etc). It includes a setting that allows you to pick the album that the switcher will pull the images from. You can also pick "All Images" which will include all the images in all the albums. You must run it the first time for the switching to begin. You don't have to keep the program running for it to switch. This version displays photos without stretching them, but it zooms to fill the space so they may not be cropped to your preference. New memory issue cropped up in WebOS 1.3.1. Now resolved. Fixed the 3 hour option, so it will save that setting. Fixed a memory leak that was causing the phone to state "To many cards are open" after switcharoo had been running for a while. Switched from using cookies to track the images used, to using the depot. If you have over 1000 images and were seeing weird messages and other problems, this version should fix it for you. Changed from demo version back to full version. Auto-sizing now works much better with non-standard images. Fixed some minor issues with the randomizer. If you have been having problems seeing some images all the time, and others not at all, this one should fix it. Select multiple albums without choosing "Photo Roll"
This is the full version. If you downloaded the demo version, you will need to delete it before installing this one. Thanks to remix2000 for a nifty icon, Brian Galura for help with finding the size of the images, and everyone on the forums for helping track down the bugs!